Apple has officially released its latest iOS 6.0.1 Software Update for iPhone, iPad and iPod Touch devices. The latest iOS 6.0.1 Firmware Update will enhance the overall performance of all iOS devices and will provide hardware and software performance improvements to Apple iPhone 5, iPhone 4S, iPhone 3GS, iPad 4, iPad 3, iPad 2, iPad Mini, iPod 5G Touch and iPod 4G Touch devices. Apple iOS users can Download and Install Official iOS 6.0.1 IPSW Firmware for iPhone 5, iPhone 4S, iPhone 3GS, iPad 4, iPad 3, iPad 2, iPad Mini, iPod 5G Touch and iPod 4G Touch devices via Direct Download Links hosted at Apple's servers given below. 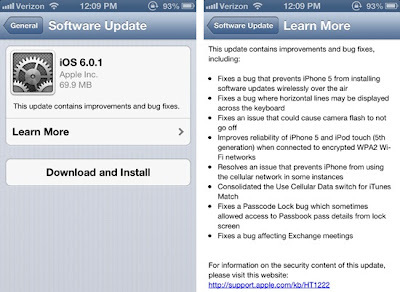 Apple iOS 6.0.1 Firmware Update for iPhone, iPad and iPod is the very first Software Update after the released of iOS 6 Final Build so iOS 6 users must install the latest firmware update to their devices for better software improvements and features performance. If any iOS device user is running an old iOS 6 version than you should Download and Install iOS 6.0.1 through Over The Air (OTA) or you can also Upgrade to iOS 6.0.1 Firmware Manually via iTunes after downloading iOS 6.0.1 IPSW Firmware files from the official Direct Download Links. Latest and Final Build of iOS 6.0.1 IPSW Firmware for iPhone, iPad and iPod is now officially available for download. (Direct Download Links of iOS 6.0.1 IPSW Firmwares for iPhone 5, iPhone 4S, iPhone 3GS, iPad 4, iPad 3, iPad 2, iPad Mini, iPod 5G Touch and iPod 4G Touch are Available). Apple has brings several new improvements and and bug fixes in new software update via iOS 6.0.1 Software Update including: fixes for Microsoft Exchange, fixation for horizontal lines on keyboard and Passbook bugs, fixes Wi-Fi connectivity issues, several bug fix related to Camera app and many others. 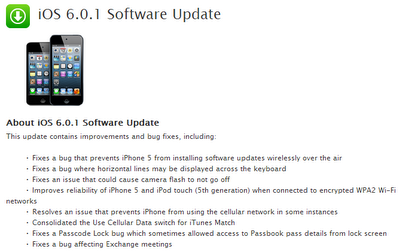 If you want to know Full Changelog of Apple iOS 6.0.1 Software Update, you can refer and read below image. Apple iPhone 5, iPhone 4S, iPhone 3GS, iPad 4, iPad 3, iPad 2, iPad Mini, iPod 5G Touch and iPod 4G Touch device users can Download and Install iOS 6.0.1 Firmware through Over The Air (OTA) software update/upgrade process in iPhone, iPad and iPod, you just need to simply heading over to Settings > General > Software Update option on your respective iPhone, iPad and iPod devices to Download and Install iOS 6.0.1 automatically via Over The Air (OTA) Online through Internet, iOS 6.0.1 software update contains file size of approx. 47.6 MB or 69.7 MB, may be a bit longer after installing it. If any user dont have an internet access or connection to download iOS 6.0.1 Firmware via OTA process than you can Download iOS 6.0.1 IPSW Firmware Files for iPhone 5, iPhone 4S, iPhone 3GS, iPad 4, iPad 3, iPad 2, iPad Mini, iPod 5G Touch and iPod 4G Touch Manually via iTunes in offline mode so if want to Download and Install iOS 6.0.1 Firmware on iPhone, iPad and iPod via IPSW Firmware setup files than you can Download iOS 6.0.1 IPSW Firmware for iPhone 5, iPhone 4S, iPhone 3GS, iPad 4, iPad 3, iPad 2, iPad Mini, iPod 5G Touch and iPod 4G Touch from Official Direct Download Links given below. You must have iTunes software installed on your Laptops or PC's. iPhone, iPad and iPod users can Download iOS 6.0.1 IPSW Firmware setup files for iPhone 5, iPhone 4S, iPhone 3GS, iPad 4, iPad 3, iPad 2, iPad Mini, iPod 5G Touch and iPod 4G Touch devices. Following Official Direct Download Links of iOS 6.0.1 IPSW Firmware of iPhone, iPad and iPod is activated and in fully working condition. After the successful download of iOS 6.0.1 IPSW Firmware you need to install iOS 6.0.1 via iTunes by connecting your respective iPhone 5, iPhone 4S, iPhone 3GS, iPad 4, iPad 3, iPad 2, iPad Mini, iPod 5G Touch and iPod 4G Touch device.